Casio has recently announced the launch of its latest HIGH SPEED EXILIM EX-FH20 digital camera, which able to capture 40 high resolution, 7 megapixel photos per second and can record high speed movies at up to 1,000 frames per second. 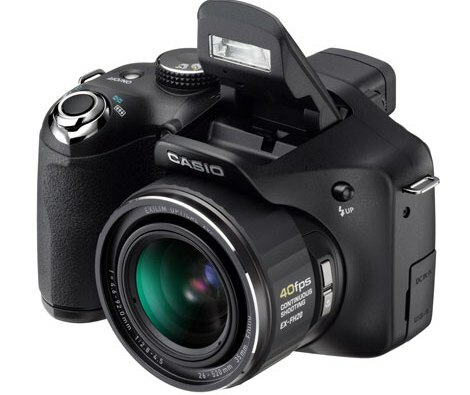 9.1 effective megapixels and high power, wide angle zoom lens – The Casio Exilim EX-FH20 is equipped with 26 mm-equivalent wide angle zoom lens that can close in on subjects with powerful 20x optical zoom. The camera also features a CMOS shift anti-shake function to support power-zoom shots. Never miss a photographic opportunity, thanks to the ultra-high speed burst shooting at up to 40 fps – The EX-FH20 can can capture an amazing 40 high resolution, 7 megapixel (3072 x 2304 pixel) images in one second. Users can select from seven burst settings, allowing them to capture from 1 fps up to 40 fps in a single burst. Further, users can prerecord up to 40 still images not just at the instant they press the shutter button, but before! Even if they press the shutter a little late, they will still catch that vital moment. High speed movie recording at up to 1,000 fps – The EX-FH20 can record high speed movie footage of motion too fast for the human eye, for ultra slow motion playback. Users can select from recording speeds of 1,000 fps, 420 fps or 210 fps and can also switch from the standard speed of 30 fps to high speed recording at 210 fps during recording at the touch of a button. High Speed Anti-Shake function – Corrects images by automatically synthesizing multiple images captured during high speed burst shooting. High Speed Night Scene setting – With or without a tripod, this feature ensures that high speed night shots come out clear and beautiful. HD Movie function – Recording at 1280 x 720 pixels, 30 frames per second. The new Casio High Speed Exilim EX-FH20 digital camera which incorporates 3-inch LCD display and electronic viewfinder is expected to be available in coming October for about $600.